Last week something randomly blew into my right eye. After a few hours at the ER, they finally managed to remove it. Since then, I’ve been wearing an eye patch like Nick Fury. Let me just say that it’s not nearly as fun as it looks. Unfortunately, it’s not healing as quickly as we had hoped. According to the ophthalmologist I saw today, the ER isn’t the best place to have a foreign object removed from your eye as they have a tendency to rub it around in there causing more damage. Until it heals properly, I probably won’t be updating Journey into Awesome as it’s not a lot of fun starring into a computer monitor at the moment. I have a few posts I was working on prior to my transformation into Fury, so hopefully I’ll be able to post them pretty quickly once my vision improves. 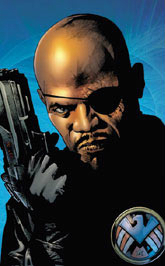 On an only marginally related note, how is Fury such a badass with only one eye? Seriously, I’m in no condition to fight right now. My depth perception is so off that successfully placing a glass on the counter rather than dropping it on the floor is considered a win.